Melvin Leroy Harder (October 15, 1909 – October 20, 2002), nicknamed "Chief", was an American right-handed starting pitcher, coach and manager in Major League Baseball, who played his entire career with the Cleveland Indians. He spent 36 seasons overall with the Indians, as a player from 1928 to 1947 and as one of the game's most highly regarded pitching coaches from 1948 to 1963. He set franchise records for wins (223), games started (433) and innings pitched (3426-1/3) which were later broken by Bob Feller, and still holds the club record of 582 career games pitched; he was among the American League's career leaders in wins (9th), games (8th) and starts (10th) when he retired. He was also an excellent fielder, leading AL pitchers in putouts four times, then a record. Harder was born in Beemer, Nebraska, and graduated from Tech High School in North Omaha, Nebraska. 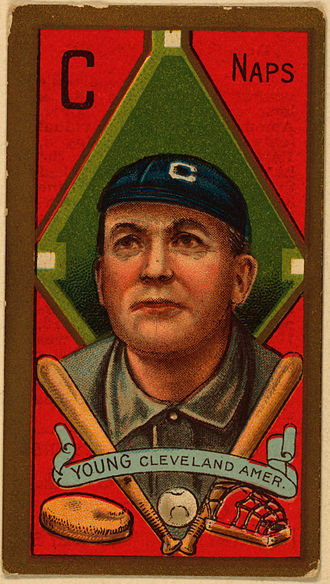 He broke in with the Indians as a relief pitcher in 1928. His pitching style revolved around his fine curveball, a hard fastball and excellent control. He joined the starting rotation in 1930, and posted a record of 39–37 from 1930 to 1932; on July 31, 1932, he pitched the first game ever at Cleveland Municipal Stadium. In 1933 he finished second in the AL with an earned run average of 2.95, trailing teammate Monte Pearson (2.33); under modern rules (one inning pitched per games played by team), enacted in 1951, Harder would have been credited with the league lead, as Pearson only pitched 135 innings. In 1934 he finished with 20 wins, led the league with six shutouts, and was again second in ERA (2.61) to Lefty Gómez. In 1935 he was second to Wes Ferrell in wins (22) and innings (287-1/3), and was fifth in the AL with a 3.29 ERA. After developing a sore elbow and bursitis in his shoulder, he won at least fifteen games each season from 1936 to 1939; he led AL pitchers in putouts in 1932, 1933, 1935 and 1938. From 1948 into the 1950s, he guided what became known as the Indians' "Big Four" pitching rotation, featuring Feller, Bob Lemon, Early Wynn and Mike Garcia; Harder had successfully transformed Lemon from an infielder into a top pitcher while working with him in the mid-1940s, and he taught Wynn the breaking ball and changeup. In 1953, Lemon tied Harder's record by leading AL pitchers in putouts for the fourth time, and he broke the record the following year as the Indians won another pennant, but lost to the underdog New York Giants in the World Series. Herb Score was named the AL's Rookie of the Year in 1955 after Harder helped to develop his curveball. During his coaching career, Harder served as interim manager of the Indians for the last game of the 1961 season and the last two games of 1962, winning all three contests. Late in his tenure, prominent young pitchers as Sam McDowell, Tommy John and Luis Tiant would come under his guidance. He was fired after the 1963 season, having spent the first 36 years of his adult life in Cleveland. Hank Greenberg also named him one of the five toughest pitchers he faced in his career. ^ "Obituary: Melvin "Mel" L. Harder". The News-Herald. 2002-10-22. Retrieved 2011-08-18. ^ Jemail, Jimmy (August 8, 1955). "The Question: Who is or was the hardest pitcher for you to hit?". Sports Illustrated. Retrieved 22 May 2017. ^ Greenberg, Hank; Berkow, Ira (1989). Hank Greenberg: The Story of My Life. Ivan R. Dee. p. 109. ISBN 9781461662389. Retrieved 22 May 2017. Beemer is a village in Cuming County, United States. The population was 678 at the 2010 census. S, according to the United States Census Bureau, the village has a total area of 0.40 square miles, all land. The first settlers of European descent arrived in the Beemer area by prairie schooner in 1864, the new inhabitants built dugouts, sod houses, eventually, log cabins. The first school in Beemer Township was taught by Mrs. William Sharp in 1867 in her log cabin, West of Beemer, a small stream called Rock Creek flows into the south side of the Elkhorn River. In 1865, August Lambrecht built a grain and flour mill on the creek about 1,000 feet from the river. Lambrechts mill, combined with the creek and with favorable conditions, attracted a small concentration of settlers. In 1871, the tracks of the Fremont and Missouri Valley Railroad, which followed the Elkhorn upstream from Fremont, reached Wisner, as the railway was extended, water stops were needed at 7-to-10-mile intervals to support the steam locomotives. The railroad stops were served by telegraphs for the purpose of administering and controlling the railroad as well as development of the telegraphs. The telegraph station at the stop located at the site of present-day Beemer was named after the nearest significant settlement, Rock Creek. Mr. Beemer built the first rail depot building, and led the drive to build a bridge across the Elkhorn. 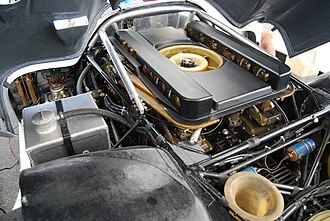 His efforts on behalf of the area were rewarded in 1886, the first century was marked by spurious growth and numerous initiatives to develop Beemer. The Beemer Times, founded by A. D. Beemer around 1 March 1886, chronicled the times, the progress, the achievements, the disasters, five churches were established in Beemer during this era. The Methodist Episcopal Church was built at the northeast corner of Fifth and Beemer Streets, in 1904, it moved to a new building on the northwest corner of Third and Fraisier streets. The first St. Johns Lutheran Church building, with a 44-foot steeple, was built on the southeast corner of Third and Lambrecht streets, the Congregational Church at the northeast corner of Third and Canfield streets was dedicated January 14,1900. The 1954 World Series matched the National League champion New York Giants against the American League champion Cleveland Indians. Giants manager Leo Durocher, who had managed teams to three National League championships, won his first and only World Series title in his managerial career, after moving West, the San Francisco Giants would not win a World Series until the 2010 season. 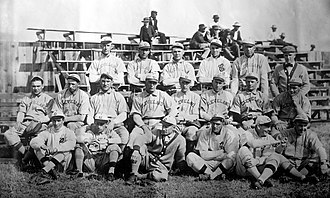 This was the first time the Cleveland Indians had been swept in a World Series and they had won four games without a loss in the 1922 World Series, but there was one tie. Game 4 was the last World Series and playoff game at Cleveland Stadium, the Indians did not return to the World Series or playoffs until 1995, the Indians, by winning the American League pennant, kept the Yankees from having a chance to win their sixth straight series. The last time the Yankees had not won the series or pennant beforehand was 1948, again and it was the only World Series from 1949 to 1958 which did not feature the Yankees. The Indians easily won the 1954 pennant on the strength of the American Leagues top pitching staff, leading the AL in team ERA at 2.72, pitchers Early Wynn and Bob Lemon were in top form, with solid contributions from Mike Garcia and Art Houtterman. Bob Feller, at age 35, could only make 19 starts, Cleveland had potent hitting, leading the AL in home runs and finishing second in runs scored, although the team managed just 30 stolen bases in 63 attempts. Bobby Ávila led the offense with 112 runs and a.341 average, while Larry Doby, defensively catcher Jim Hegan made only four errors in 134 games and threw out 44% of would-be base stealers. The New York Giants entered the World Series with a top pitching staff as well, with Johnny Antonelli, Rubén Gómez. The Giants relied more heavily on relief pitching with Hoyt Wilhelm and Marv Grissom rounding out a staff led the NL in team ERA at 3.09. Manager Leo Durocher used a solid, consistent lineup with all his starters, except for the catching position, Willie Mays led an offense that featured Don Meuller, Al Dark, Hank Thompson and pinch-hitter extraordinaire Dusty Rhodes. NL New York Giants vs. AL Cleveland Indians Cleveland got on the board first and fast, leadoff man Al Smith was hit by a pitch, Bobby Ávila singled and Vic Wertz brought home both with a triple to right. Early Wynn Jr. nicknamed Gus, was an American Major League Baseball right-handed pitcher. He pitched for the Washington Senators, Cleveland Indians, and Chicago White Sox during his 23-year major league career and he was identified as one of the most intimidating pitchers in the game with his powerful fastball combined with a hard attitude towards batters. Wynn was inducted into the Baseball Hall of Fame in 1972, Wynn was born in Alabama and signed with the Senators at the age of 17, deciding to pursue baseball instead of finishing high school. He spent a couple of seasons in the leagues, had a brief major league stint in 1939, returned to the major leagues in 1941. He missed the 1945 MLB season and a portion of the season while serving in the United States Army during the latter part of World War II. Wynn was a member of one of baseballs best pitching rotations along with Bob Feller, Mike Garcia and he won the 1959 Cy Young Award, beginning to rely on the knuckleball as the velocity of his pitches declined. He finished with exactly 300 career wins, he had spent several months in pursuit of his 300th win, Wynn served as a coach and broadcaster in the major leagues after his retirement as a player. In 1999, he was included on The Sporting News list of the 100 greatest players in baseball history and he died that year in an assisted living facility following heart related problems and a stroke. 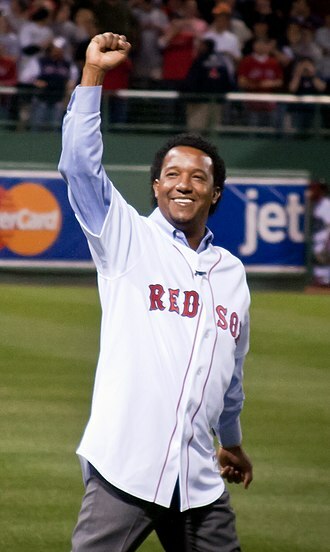 Wynn was born in Hartford, the son of Blanche Wynn and Early Wynn Sr. an automobile mechanic and he excelled at both football and baseball in high school. As a sophomore, Wynn was about to become the top running back at his school when he suffered a leg on a punt return. The injury forced him out of football and focused his attention on baseball, Wynn described it as my best break ever. When he was a teenager, Wynn attended a session in Florida for the Washington Senators. He impressed Senators coach Clyde Milan enough that the organization offered him a league contract. Wynn signed with Washington for $100 per month and decided not to high school. In baseball or softball, a strikeout occurs when a batter accumulates three strikes during a time at bat. It usually means the batter is out, a strikeout is a statistic recorded for both pitchers and batters, and is denoted by K. Although a strikeout suggests that the pitcher dominated the batter, the style that generates home runs leaves batters susceptible to striking out. Some of the greatest home run hitters of all time — such as Alex Rodriguez, Gorman Thomas, Reggie Jackson, and Sammy Sosa — were notorious for striking out. A pitched ball is ruled a ball by the if the batter did not swing at it and, in that umpires judgment. Any pitch at which the batter swings or, that in that umpires judgment passes through the zone, is ruled a strike. Each ball and strike affects the count, which is incremented for each pitched ball with the exception of a ball on any count with two strikes. That is, a strike may only occur by the batter swinging and missing at a pitched ball. A pitched ball that is struck by the batter with the bat on any count, a batter may strike out by bunting, even if the ball is hit into foul territory. In Japan, this is called furinige, or swing and escape, in Major League Baseball, it is known as an uncaught third strike. When this happens, a strikeout is recorded for both the pitcher and the batter, but no out is recorded, because of this, a pitcher may occasionally be able to record more than three strikeouts in one half-inning. In baseball scorekeeping, a strikeout is recorded as a K. A strikeout looking is often scored with a backward K, and sometimes as a K-L, CK, despite the scorekeeping custom of using K for strikeout, SO is the official abbreviation used by Major League Baseball. 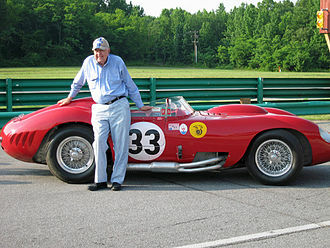 K is still used by fans and enthusiasts for purposes other than official record-keeping. The K may be placed backward in cases where the batter strikes out looking, the use of K for a strikeout was invented by Henry Chadwick, a newspaper journalist who is widely credited as the originator of the box score and the baseball scorecard. As is true in much of baseball, both the box score and scorecard remain largely unchanged to this day, Chadwick decided to use K, the last letter in struck, since the letter S was used for sacrifice. Edward Miguel Mike Garcia, nicknamed Big Bear and Mexican Mike, was an American right-handed pitcher in Major League Baseball. Garcia was born in San Gabriel and grew up in Orosi and he entered minor league baseball at the age of 18. After one season, he joined the U. S. Army, following his military discharge, Garcia returned to baseball. He was promoted to the MLB in 1948 and he played 12 of his 14 major league seasons for the Cleveland Indians. From 1949 to 1954, Garcia joined Bob Lemon, Early Wynn, historians consider the Big Four to be one of the greatest starting pitching rotations in baseball history. During those six seasons with the Big Four, Garcia compiled a record of 104 wins against 57 losses and he had two 20-win seasons and led the American League in earned run average and shutouts twice each. Garcias best season came in 1954 when the Indians won a league record 111 games, Baseball historian Stephen Lombardi said that Garcia may have been the best AL pitcher that year. 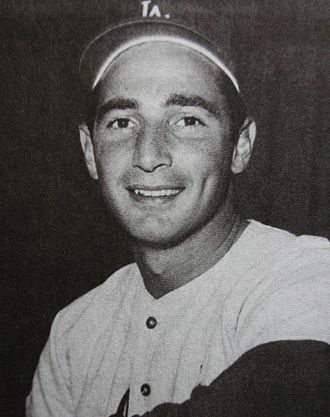 Garcia remained with the Indians until 1959, but never duplicated the success he had achieved in 1954, in his last five seasons with Cleveland, he finished with losing records three times. After leaving the Indians, Garcia spent a season with the Chicago White Sox, Garcia retired from baseball in 1961. He developed diabetes within a few years and suffered from kidney disease, Garcia died outside of Cleveland at the age of 62 and was buried in his home state of California. Baseball experts and former teammates have commented on Garcias overpowering pitching, his control and his low ERA. 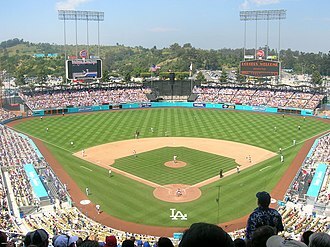 Garcia was born in San Gabriel. He grew up on a ranch in Orosi, where his Indigenous Mexican father, Merced Garcia, mikes father raised horses, and Mike aspired to race them. He participated in one race and was thrown from the horse, Garcia played four years of high school baseball, the first three years at Orosi High School and the last at Visalia High School. Garcia was pitching in baseball when Cleveland Indians scout Willis Butler noticed him in Tulare. In 1942, Butler signed him as a free agent to the organizations Class D farm team. Garcia earned a 10–10 win–loss record with Appleton and he spent the next three years as a signalman in the United States Army during World War II. Herbert Jude Score was an American Major League Baseball pitcher and announcer. He pitched for the Cleveland Indians and Chicago White Sox from 1955 through 1962 and he was television and radio broadcaster for the Cleveland Indians from 1964–1997. Score was inducted into the Cleveland Indians Hall of Fame in 2006, Herb Score was born in Rosedale New York in 1933. At 3, he was run over by a truck and had rheumatic fever, as a teenager, he starting playing basketball and baseball at Holy Name of Mary School until he moved with his family to Lake Worth, Florida. In 1952, he threw six no-hitters for the Lake Worth Community High School baseball team, on June 7,1952, his 19th birthday, he signed a baseball contract with the Cleveland Indians. He was sent to Indianapolis of the American Association where he made 10 pitching starts, in 1953, he moved to Clevelands Class A affiliate, Reading of the Eastern League. There he met and became friends with future outfielder Rocky Colavito from the Bronx. For the 1954 season, both were promoted to Triple-A Indianapolis, Score was named The Sporting News Minor League Player of the Year and began to be referred to as left-handed Bob Feller. In 1955, Score came up to the Major Leagues as a rookie with the Cleveland Indians at the age of 21 and he appeared on the cover of Sports Illustrated magazine on May 30,1955. Score struck out 245 batters in 1955, a Major League rookie record that stood until 1984 and it was the first time in MLB history a regular starting pitcher averaged over one strikeout per inning. On May 7,1957, during the first inning of a game against the New York Yankees at Municipal Stadium in Cleveland. McDougald lined the pitch to the mound and struck Score in the face, breaking Scores facial bones, the ball caromed to third baseman Al Smith, who threw McDougald out before rushing to the pitching mound to Scores aid. McDougald, seeing Score hit by the baseball and lying down and injured, ran immediately to the mound, instead of first base. McDougald reportedly vowed to retire if Score permanently lost his sight in one eye as a result of the accident, Score eventually recovered his 20/20 vision, though he missed the rest of the season. Charles Herbert Red Ruffing was an American professional baseball player. A pitcher, he played in Major League Baseball from 1924 through 1947 and he played for the Boston Red Sox, New York Yankees, and Chicago White Sox. Ruffing is most remembered for his time with the highly successful Yankees teams of the 1930s and 1940s, Ruffing dropped out of school as a child to work in a coal mine in his native Illinois. He played for the company baseball team as an outfielder. After he lost four toes from his foot in a mining accident, he became unable to run in the field. He played in minor baseball in 1923 and 1924 before making his MLB debut with the Red Sox. After struggling with Boston, pitching to a 36–93 win–loss record, the Red Sox traded Ruffing to the Yankees, after one season with the White Sox, Ruffing retired from pitching to work in coaching. He served as a coach for the White Sox, a pitching coach for the New York Mets. Ruffing was a member of six World Series championship teams with the Yankees and he appeared in six MLB All-Star Games. 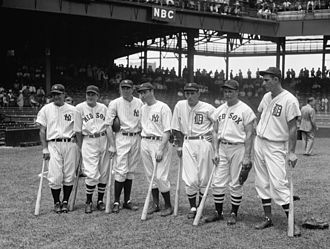 The 1948 World Series matched the Cleveland Indians against the Boston Braves. Though superstar pitcher Bob Feller failed to win either of his two starts, the Indians won the Series in six games to capture their second championship and their first since 1920. Consequently, this was the first, and to date only, television coverage of the World Series increased this year, but due to the medium still being in its infancy coverage was strictly regional. This was the only World Series from 1947 to 1958 not to feature a New York team, the teams would meet again in the 1995 World Series won by the Braves—by relocated to Atlanta. Feller walked Braves catcher Bill Salkeld to open the inning, Braves manager, Billy Southworth replaced the slow-footed Salkeld with Phil Masi, who entered the game as a pinch runner. Mike McCormick followed with a bunt, advancing Masi to second base. Feller issued a walk to Eddie Stanky, who was replaced by Sibby Sisti. Feller tried to pick off Masi at second base, Indians shortstop Lou Boudreau appeared to tag Masi out, but umpire Bill Stewart called him safe. Tommy Holmes proceeded to hit a single that allowed Masi to score the run of the game. The umpires controversial ruling touched off heated debates among the media and fans, although Feller allowed only two hits, he took the loss in what would be the closest he ever came to winning a World Series game. Upon his death in 1990, Masis will revealed that he really was out on the pick-off play. C. and New York City, an Associated Press reporter observing the demonstration said, Technically, it was surprisingly good. For the third game, no home runs were hit by either team. This would not happen again in a World Series until 2014, satchel Paige appeared for the Indians, becoming the first black pitcher to take the mound in World Series history. 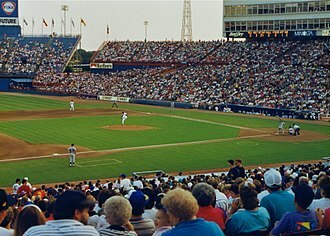 The previous days single-game attendance record was broken with 86,288 fans,1948 World Series, Cleveland Indians over Boston Braves Cohen, Richard M. Neft, David S. The World Series, Complete Play-By-Play of Every Game, 1903–1989, archived from the original on 2008. Relief pitchers are further divided informally into various roles, such as closers, set-up relief pitchers, middle relief pitchers, left/right-handed specialists, and long relievers. 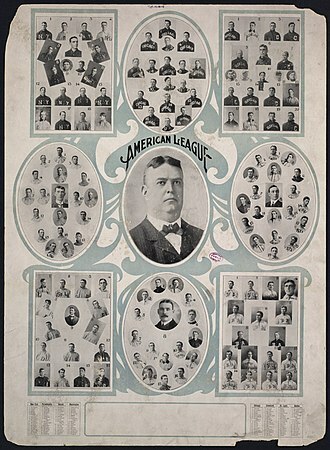 A teams staff of relievers is normally referred to metonymically as a teams bullpen, which refers to the area where the relievers sit during games, in the early days of Major League Baseball, substituting a player was not allowed except for sickness or injury. 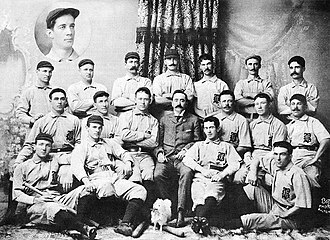 An ineffective pitcher would switch positions with another player on the field, the first relief appearance in the major leagues was in 1876 with Boston Red Caps outfielder Jack Manning switching positions with pitcher Joe Borden. In this early era, relief pitchers changing from a role to the pitchers box in this way were often called change pitchers. This strategy of switching players between the mound and the outfield is still employed in modern baseball, sometimes in long extra inning games where a team is running out of players. In 1889, the first bullpen appearance occurred after rules were changed to allow a player substitution at any time, early relief pitchers were normally starting pitchers pitching one or two innings in between starts. In 1903, during the game of the inaugural World Series. Firpo Marberry is credited with being the first prominent reliever, from 1923 to 1935, he pitched in 551 games,364 of which were in relief. Baseball historian Bill James wrote that Marberry was a modern reliever—a hard throwing young kid who worked strictly in relief, worked often, another reliever, Johnny Murphy, became known as Fireman for his effectiveness when inserted into difficult situations in relief. Nonetheless, the full-time reliever who was entrusted with important situations was more the exception than the rule at this point, often, a teams ace starting pitcher was used in between his starts to close games. Later research would reveal that Lefty Grove would have been in his leagues top three in saves in four different seasons, had that stat been invented at the time, gradually after World War II, full-time relievers became more acceptable and standard. The relievers were usually pitchers that were not good enough to be starters, relievers in the 1950s started to develop oddball pitches to distinguish them from starters.